Hawaiian Falls The Colony Waterpark features multiple water slides, a family wave pool, a lazy river with waves, and an interactive tree house attraction. From the 65-foot-high Waikiki Wipeout body slide to the Kona Kooler, families will enjoy a variety of aquatic rides and activities at this popular waterpark. Older children will love thrill rides like the fast-moving Flyin' Hawiian, the Hawaiian Halfpipe, and the Torpedo. The interactive Keiki Kove rain fortress is filled with fountains, water jets, and a giant bucket that splashes water every few minutes on the giggling kids below. While children will give The Colony Waterpark thumbs up for its exhilarating rides, cool souvenirs, and Hawaiian-themed setting, parents will appreciate the waterpark's clean and safe environment. 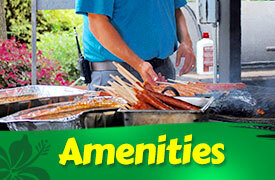 Adults love that Hawaiian Falls Texas waterparks feature picnic areas, restaurants, and surf shop too. 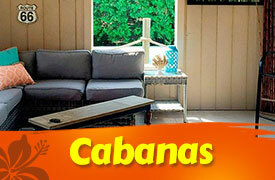 Private cabanas available at Cabana Cove and Keiki Kove allow your family to relax and transform your visit to this waterpark in Texas into a mini vacation. Menu and Surf Shop items at Hawaiian Falls The Colony are subject to availability and may change at any time. Aloha Y'all! We are still Texas after all! No party is complete without some classic Texas style barbecue. Freshly grilled hamburgers, all beef hot dogs and mouth watering brisket are just a few items at Surf Side BBQ. The grill is only open on select days, generally Thursday through Sunday. 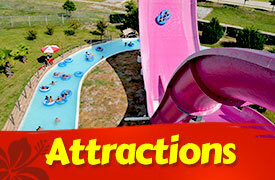 Hawaiian Falls - The Colony is located 1/2 mile north of the Highway 121 and Plano Parkway intersection. 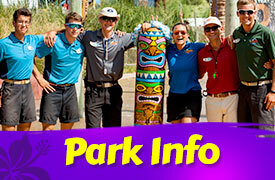 Parking is always free at Hawaiian Falls The Colony. VIP Parking may also be available for a nominal fee. Hawaiian Falls The Colony always has free floating tubes and life jackets. Coolers are allowed but there is a fee. Hawaiian Falls The Colony is the most northern Texas waterpark. Supplying endless water adventures, Hawaiian Falls is dedicated to family-fun all summer long. If you’re visiting the North Texas area or live right down the street, come on out to our Dallas waterpark in The Colony this summer. Hawaiian Falls The Colony is your family’s waterpark for exciting water thrills , whether you live in Gainesville, Lewisville, Plano, or Denton.